Traveling is exciting but can also pose many challenges. This is especially true for those traveling into a different hemisphere. 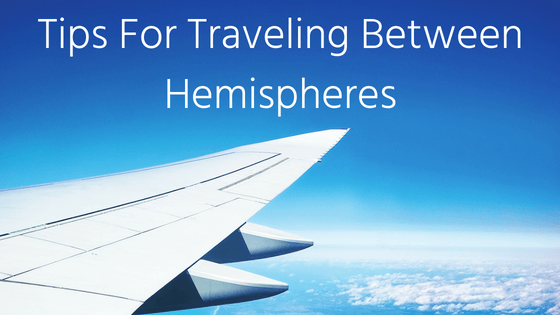 Keep these tips in mind if you plan on traveling between hemispheres for your next vacation. As you travel closer to the north and south poles, the ratio of daytime to nighttime hours becomes more drastic. Due to the tilt of the planet and its position in relation to the sun, the polar ends of the planet either receive an abundant amount of daylight hours with very little nighttime hours and vice versa. The time of year you visit certain countries will determine which extreme you will encounter. There are websites that allow you to enter the country and city to which you’ll be traveling so that you can see when the sun rises and sets and how many daylight and nighttime hours you have for work and leisure. It’ll also be wise to set alarms on your smartphone to alert you of designated mealtimes so that you don’t accidentally miss a meal due to restaurants and stores being closed. Checking the weather of your travel destination is a common tip given to novice travelers. This is to help you know what type of clothes to pack. This tip should be heeded even more fervently when you travel to another hemisphere. The way hemispheres work is that they experience opposite seasons. When it’s winter in the northern hemisphere, it’s summer in the southern hemisphere. This sort of extreme seasonal difference can really mess up your travels if you pack clothes and gear for the season in your own hemisphere. A quick search online can help you determine the current season in the hemisphere of your travels and the effect it has on the local weather. There is an invisible line that separates the western and eastern hemispheres which denotes the beginning of the next day. When you travel over this International Date Line, you automatically exist in the next or previous day, depending on which hemisphere you depart from. It is important for you to keep this line in mind when reading your travel tickets and purchasing hotel reservations. You may not purchase enough days at the hotel to cover your entire visit or even miss your flight.